At the #LDBeauty event, we each had the pleasure of choosing an at-home peel treatment to try. 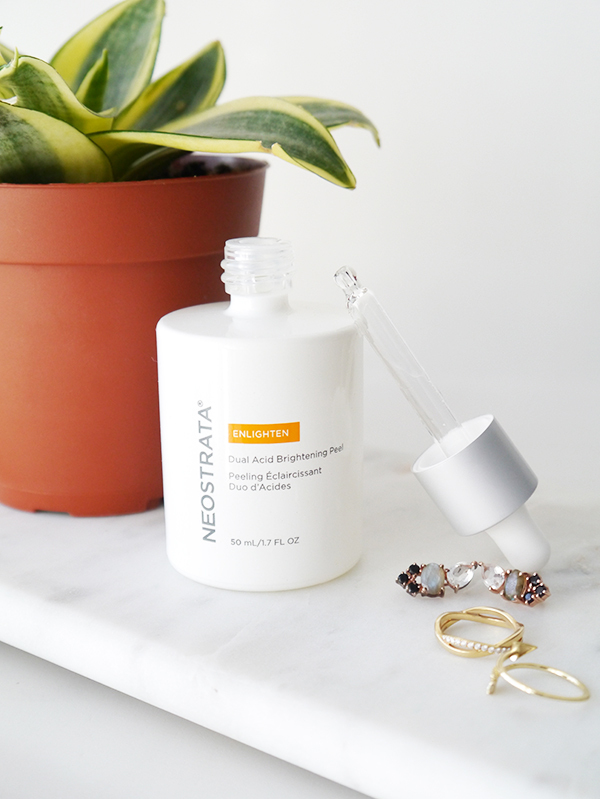 I went with the NeoStrata Enlighten Dual Acid Brightening Peel ($80 on sale for $60 at London Drugs), a treatment that improves tone, clarity, and texture. 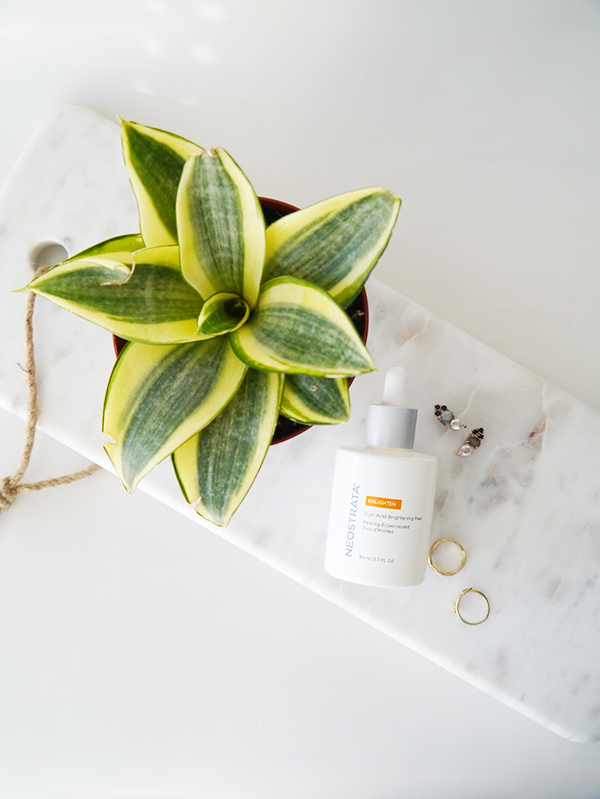 The formula contains 10% Alpha Hydroxy Acid (AHA), a workhorse of a chemical exfoliant that gets rid of old skin cells and retexturizes skin; 10% Polyhydroxy Acid (PHA), a gentler form of AHA that isn't as irritating and can act as a humectant; and a brightening peptide to really even out skin tone. I really loved how easy this peel was to use, especially as someone who's new to at-home peels. My usual exfoliating product is something that combines chemical and manual exfoliants (read: a low concentration of acids and little scrubby granules). While the scrubbing action can be satisfying, these exfoliants don't pack the power of a 20% chemical peel and they can be kind of messy to use. 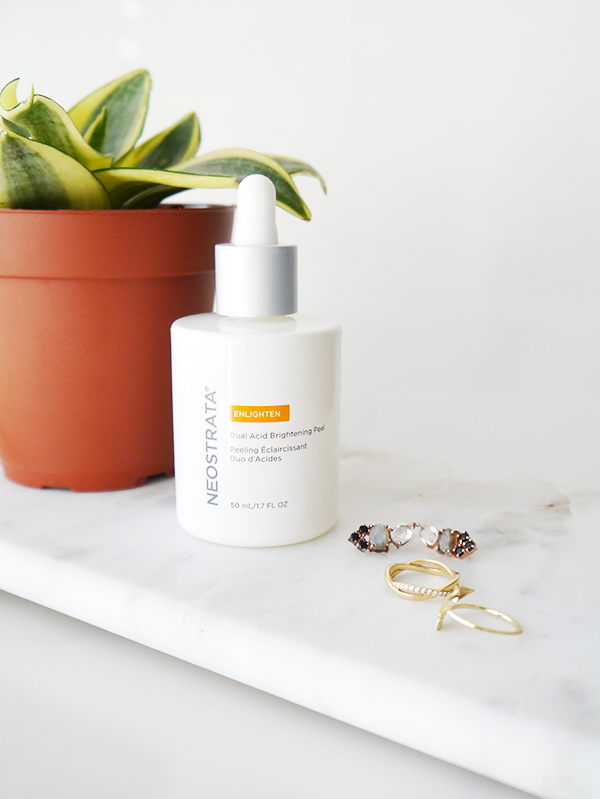 Not so with the NeoStrata peel. The dropper bottle made it easy to dispense just the right amount. I'd apply couple of drops to my forehead, each cheek, my nose and chin, and the sides and back of my neck, then wait the requisite 15-20 minutes and rinse off at the end. There was no excess product dripping, there were no errant granules to cleanse off my face. I could make myself a cup of tea and journal while the peel worked its magic. The instructions say it can be used 1-3 times a week for 15-20 minutes each time, but depending on how sensitive your skin is to acids, you might want to lessen the frequency or the time you leave it on. A couple of other things you should keep in mind with chemical peels: First, be diligent with applying SPF daily; and second, you'll want to examine the rest of your skincare products and lay off on any other products with acids or exfoliants (the cumulative effect between these and the NeoStrata peel might cause redness and sensitivity). 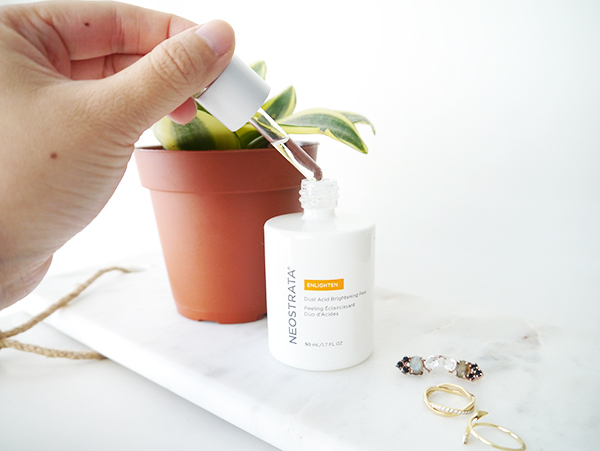 I've been using the NeoStrata Enlighten peel 1-2 times a week since the #LDBeauty event. After each use, my skin was super soft and smooth for the next couple of days. The pores on my cheeks and nose appeared smaller; the congested pores/raised bumps on my temples and cheeks cleared up; and the dark patch on my right cheek lightened noticeably. What else can I say? This stuff works. $80 is admittedly a bit steep for a drugstore product, but this peel is currently on sale for $60 at London Drugs. What's more, the generous-sized 50 ml bottle will last ages considering you're only using a couple drops at a time. Run, don't walk, to your nearest London Drugs and pick up a bottle ASAP. You posted this when I was on vacation so I didn't see this until now. OMG I'm so happy that you love this too. I'm OBSESSED over this and other AHA peels now. I'm working on a story that is just all peels and acids. I think after trying several, my favourite is still this one. It's just so easy to use and so easy to incorporate into your existing routine that EVERYONE should have a bottle of this on their bathroom counter. Ooh I can't wait to see your review! I have been using this product for almost a month now, 3 times a week. I was recommended by a beautician at Shoppers Drugstore and I must say the results are very remarkable and many people around me have expressed their positive opinions and are interested in trying the product as well. My tone is becoming more radiant and even. Am so happy I came across this product. You should definitely try it. So glad you like it! I've been enjoying this peel as well.